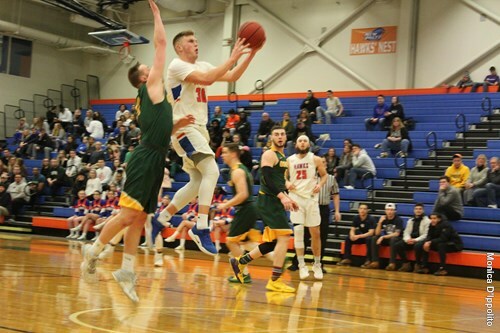 The New Paltz men’s basketball team split two close games on the road last weekend improving their overall record to 11-9 and 6-7 in the State University of New York Athletic Conference (SUNYAC). The Hawks bested the Golden Eagles from the College at Brockport on Friday 69-67 and fell to the SUNY Geneseo Knights 62-58 on Saturday. Just as their previous matchup, the Hawks went back and forth with the Eagles throughout a contest that saw five lead changes and a tie. Key free throws and defensive stops allowed New Paltz to hang on to the victory as the game clock expired. Brockport held the last possession of the game and after advancing the ball to their front court called a timeout with just under ten seconds remaining. When the game resumed the Hawks fouled immediately, putting first-year guard Danny Ashley at the charity stripe. Ashley made the first free throw, bringing the score to 69-67, and intentionally missed the second, playing it off the rim. No clear possession was gained in the scramble for the subsequent loose ball and it was eventually tipped out by New Paltz. The Eagles inbounded the ball underneath the basket to third-year forward and leading-scorer Justin Summers who went up for a layup in the paint but was unable to tie the score under third-year forward Scott Reisert’s defense. Reisert recovered the defensive rebound as the final buzzer sounded. Reisert finished with 15 points, seven rebounds and two blocks, just behind third-year captain Tristan Wissemann, with the game-high 18 points, five rebounds and two assists. Second-year guard Jake Passaretti chipped in 13 points, six rebounds, four assists and a steal off the bench. On Saturday, SUNY Geneseo defeated the Hawks after an early second-half 20-3 run swung the game in their favor. New Paltz entered the second half leading 32-27 but fell to a 13-point deficit following a run. The Hawks answered with 10-straight points of their own and got within two with four minutes left. The Knights were able to ice the victory with crucial free throws in the waning seconds of the matchup. Wissemann led the game with 12 points and five rebounds, followed by Cory Garcia, who tossed in 11 points, grabbed eight rebounds, three assists and two steals. Passaretti chipped in another 10 points and three assists and Reisert finished with seven points, nine rebounds, three blocks, two steals and an assist. The men return to the Hawk Center this weekend to face Buffalo State Friday at 7:30 p.m. and Fredonia Saturday at 4 p.m. as they continue to seek a playoff berth.